Well hello there! 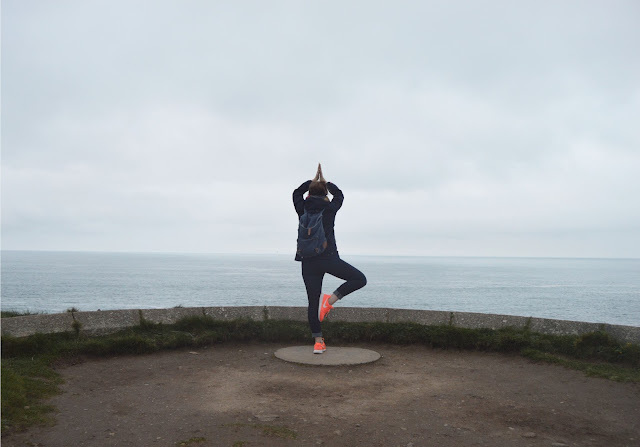 Today I'm bringing you another little round up of things I've had my eye on recently! 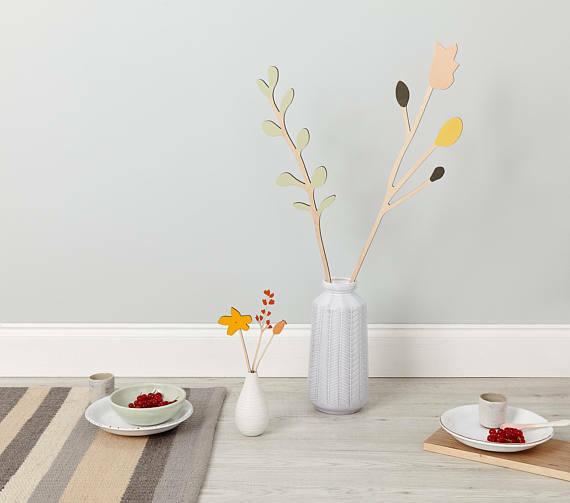 There's a real mixture here - we've so nearly finished decorating our bedroom so a couple of these bits I've got in mind for in there, and my sister is moving out this weekend (hoorah!) so as of next week we'll have our spare bedroom back! We'll be keeping it as a spare/guest room so it'll need a bit of a jazzing up and a few of these things would be perfect in there! There are also a couple of things that have definitely crept in because Autumn is on the way. I love having fresh flowers around the house but I'm always a little reluctant to buy them for myself for a few reasons. One, they're expensive, two, I'm rubbish at remembering to change the water and wilted flowers don't really have the same effect, and three, I seem to be allergic to everything at the moment, so flowers in the bedroom isn't really conducive to a good nights sleep. However, these wooden flowers from Anna Winscombe would solve all my problems. I already have a beautiful little wooden bird brooch from Anna which I love, and I think these wooden flowers are really minimal and striking - and definitely won't make me sneeze! They're available in lots of different sizes, but the spot I have in mind it quite large so I think the larger ones would be perfect! As you may remember from my podcasts post, I've recently fallen a bit in love with Edd Kimber. I spotted his recommendation for this book on twitter a few days ago and it sounds bloody AMAZING!! I'm a huge fan of salted caramel (actually, I'm a fan of salted anything!) 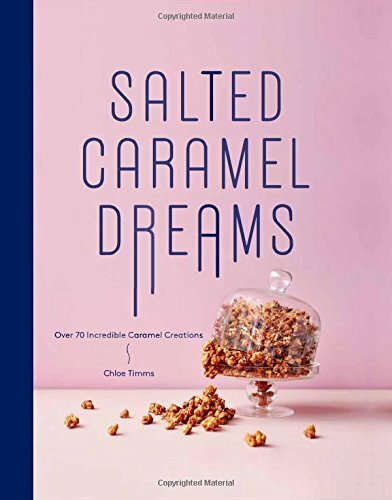 and an entire book of salted caramel treats sounds right up my street. 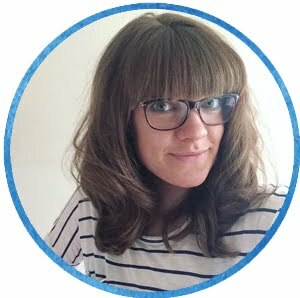 Salted Caramel Dreams comes from Chloe Timms, of London based Fatties Bakery. The amazon listing for it allows you to look inside, and some of the recipes sound delicious (not to mention incredibly indulgent and definitely for special occasions) - caramel rye truffles, salted caramel custard and...brace yourselves...chocolate chip salted caramel peanut butter!! I need this book in my life for all the Autumn and Winter occasions when treats are in order! This is maybe a bit boring, but whenever we buy something for our home, even if it's something small, we like to make sure we love it! Now it's starting to get a bit chillier, my dressing gowns and onesies were starting to litter our bedroom and I was getting on my own nerves leaving them all over the place. 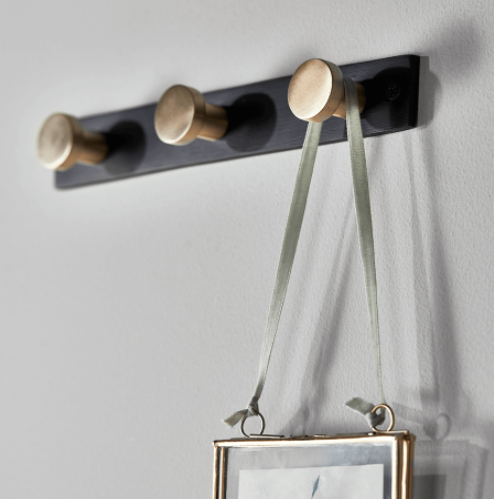 I've been using an overdoor hook to corral everything which is working well as there's not much point pointing them away when I wear them everyday, so hiding them behind the door keeps them accessible yet out of the way. I don't love it though, so I've been on the lookout for a small rack of brass hooks that will sit on the back of the door. This one from Cox and Cox is a little pricey, but it would be perfect! As soon as I saw this print I loved it. Since we were in our early twenties, D has done a daft running game where he'll grab my hand and run down the road, or through the reception of a hotel, or down a corridor in an attempt to embarrass me. He first did it when I was about 20, we were staying at The Strand Palace and felt completely out of place in such a posh hotel. Far from being embarrassed though, we both just ran along the corridors laughing like kids. He's done it ever since, and this print from Oliver Bonas makes me smile just thinking about the silliness. I'm kind of waiting for it to go into the sale, but I know I'll be disappointed if it sells out so perhaps I should just order it - such first world problems! We've recently recycled all our old bedding in favour of some crisp navy sheets which are making me want to go to bed at 7pm every evening! What I didn't consider before piling them all into the textile recycling bin is that we will need to make the spare bed up once my sister has moved out. 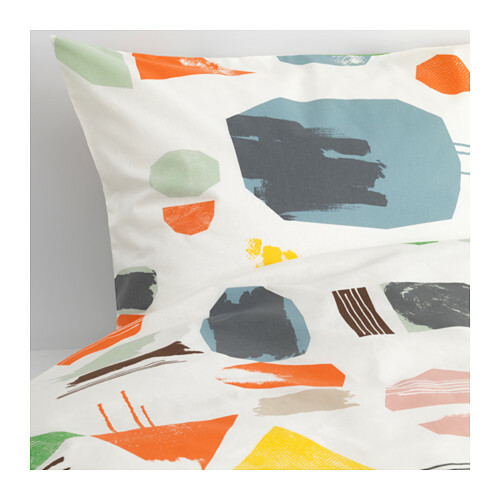 So, I set about finding some cheap-but-stylish bedding and I think this graphic set from Ikea might be the one! The room is currently grey and yellow, with white walls, a yellow light fitting and grey carpet and curtains. I'd like to add a little more colour to the space while keeping the things we currently have so this set would tie everything together nicely. It's really cheap (somewhere around £25) which is fine as it won't be used often, and I love that the double and king size Ikea bedding sets come with four pillow cases! One of my absolute favourite ways to relax, switch off, warm up, or just spend an hour on my own is to run a really deep bubble bath. I'm firmly of the opinion (so much so that I wrote a whole post about it last year) that unless you have candles, a pile of magazines, a drink, some music (or an audiobook) and potentially some snacks then it's not worth it and you might as well have a shower! I love a bath all year, but when it's cold outside there really is nothing better than sinking into the warm water and finally defrosting. 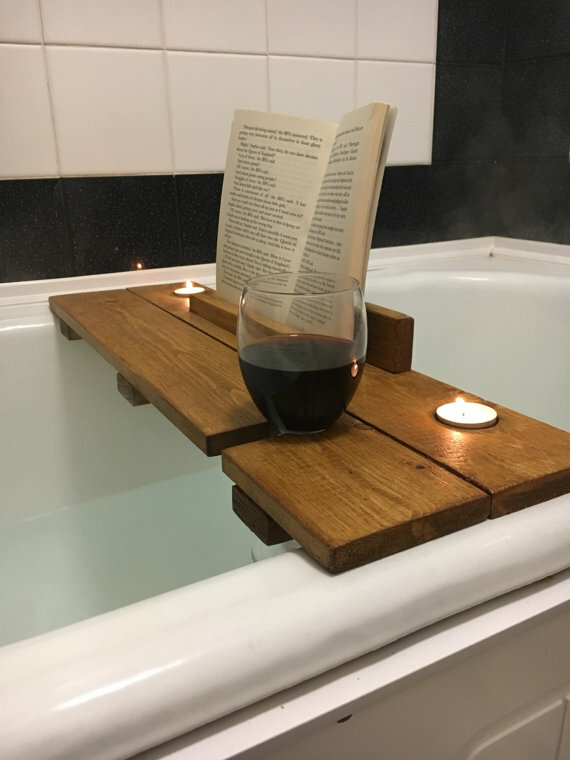 This gorgeous wooden bath caddy from Rustic and Retro Furniture on Etsy would bring together all the necessary bath elements perfectly; somewhere to prop your book to prevent soggy pages (or perhaps a phone or tablet if like me you've taken to catching up with vlogs in the bath) little cut outs for tea lights, a genius slot to slide in a wine glass if its a with-wine kind of bath, and also plenty of space for a mug if it's more of a hot chocolate affair! Once my sister is gone, our spare bedroom furniture will consist of a kingsize bed, a bedside table, bookcase and a corner desk. We have a third bedroom too which will be used as a nursery when we need it, so for a while this room will be a combination of office, yoga space and guest bedroom. We therefore want there to be somewhere to hang clothes if people stay but don't want to fill the space with a wardrobe. 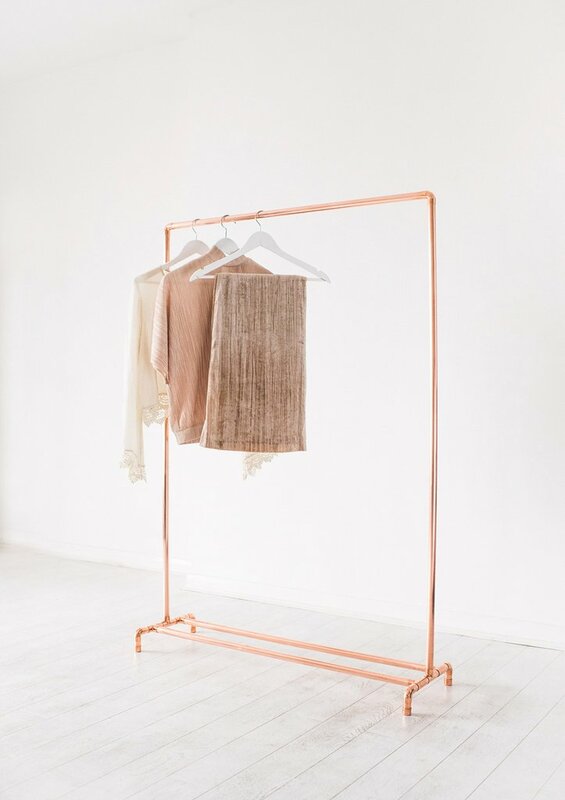 This copper pipe rail from The Little Deer is beautiful enough to be out all the time, and could also be used to display blankets, maybe with a box or basket on the rail at the bottom for yoga props and candles. There we have it! I don't always actually purchase the items on my wish lists (although Father Christmas and the birthday fairy do look through them every now and then) but there are a few on this one which I think will definitely be coming home with us. Talking of the man in red...I'm considering doing some Christmas gift lists this year. What do you think...who would you like to see gift guides for? Would you even want them to be categorised? 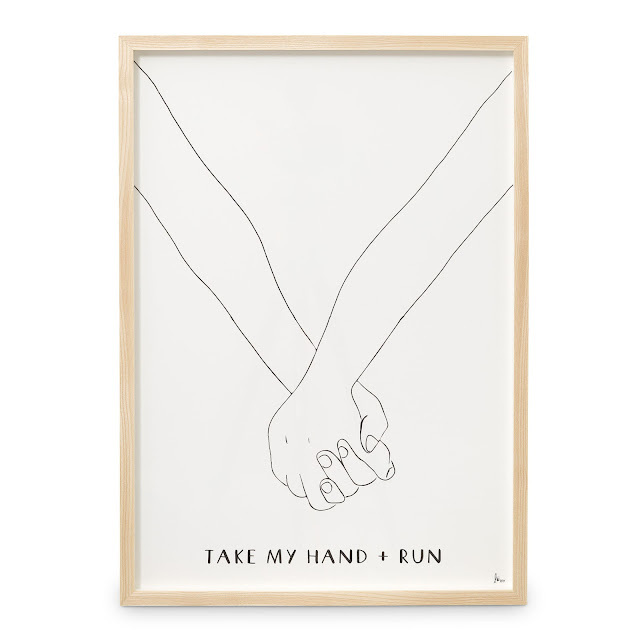 How about a DIY gift list? Let me know what you think, either here or over on twitter or instgram! As a family we are thinking that we need to cut back on our gifting spends for lots of reasons, so some stylish own makes or cheapies would be great...no pressure! I love your wishlist posts, they always contain very tempting items and always end up bookmarked or sent to my husband! Ditto above, we're saving for a deposit at the moment so some economical Christmas giftlists would be gratefully received!